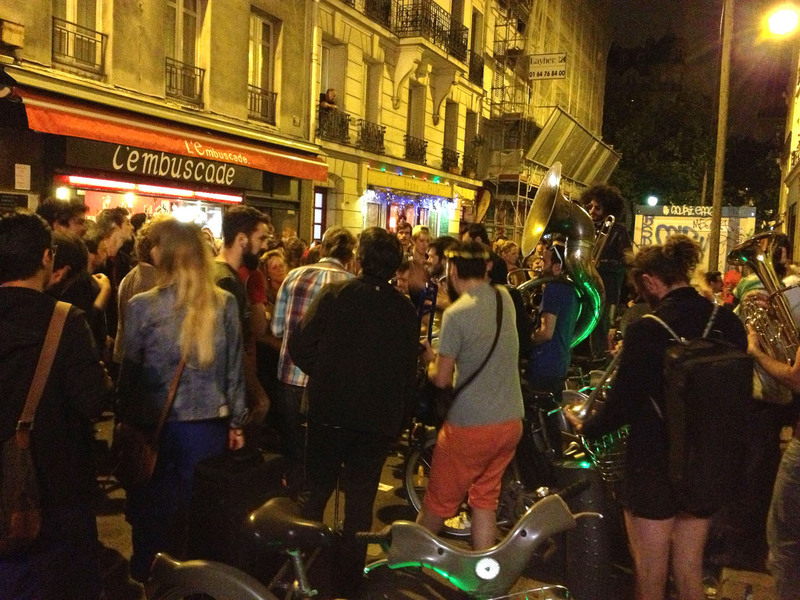 It’s past 2:00 a.m. and a 10-piece brass band is still kicking out the jams on Rue Crussol. The hoots and whistles of the crowd they’ve gathered bounce off the buildings in the tiny street. 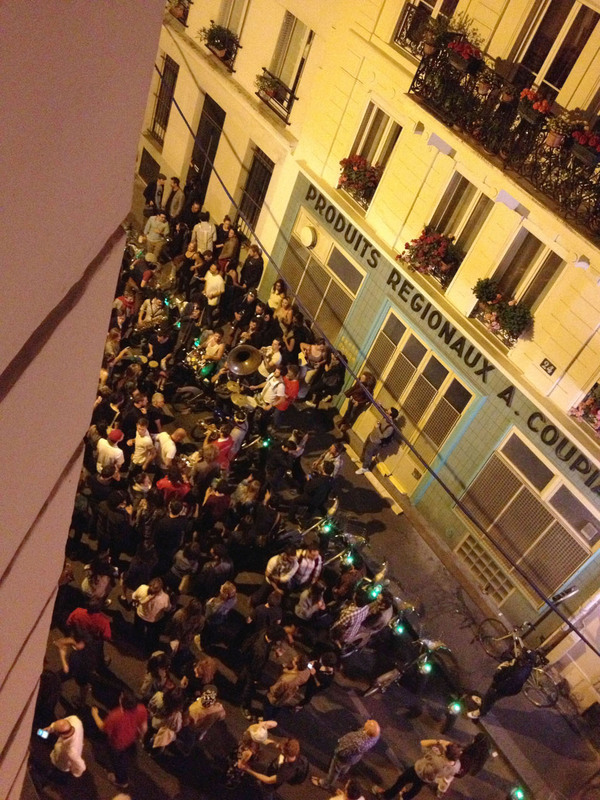 On nearby Boulevard Voltaire, the womp-womp-womp of a bass booms out of a bar where people spill onto the street, six deep. There will be no sleep tonight, so it’s useless to try. On the longest day of the year, the sun has only just set, and the party may well go on until it rises again. 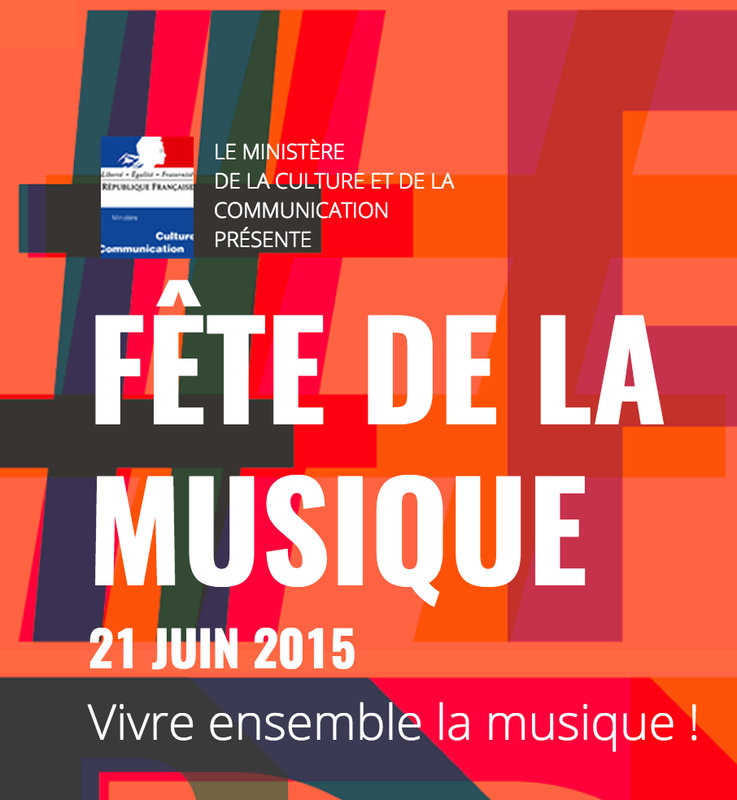 This is June 21st, the day of La Fête de la Musique, the annual festival honoring the summer solstice. 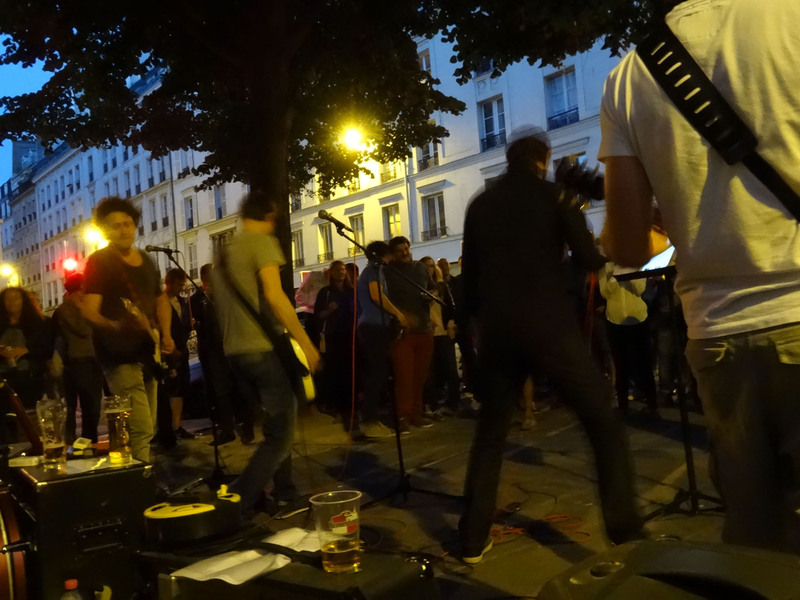 This year it fell on a Sunday, which meant the festivities started early, and Parisians were free to make the most of this long day of sun and music. 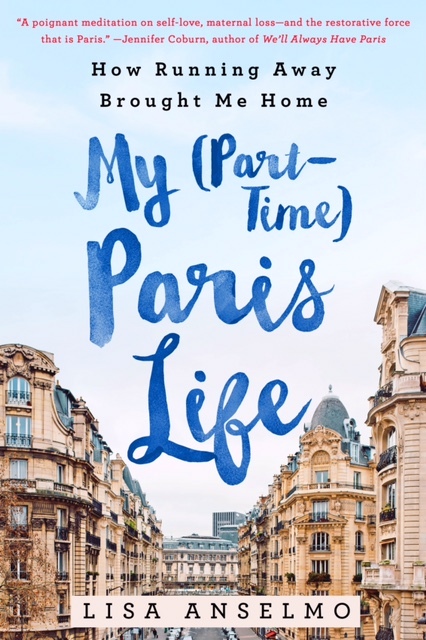 All over Paris official and unofficial musical acts, DJ block parties, singalongs sprouted up in front of bars, in plazas and gardens, in courtyards and doorways—music emanating from every cranny of the city. 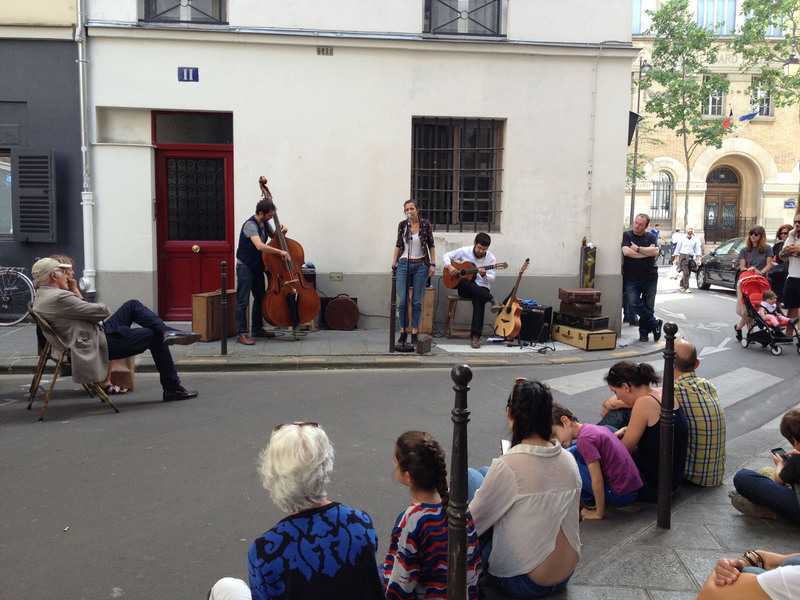 You could easily see three or four acts in as many streets, one band’s rhythms fading into another’s as you walked along, like changing the dial on your radio—jazz, classical, swing, blues. 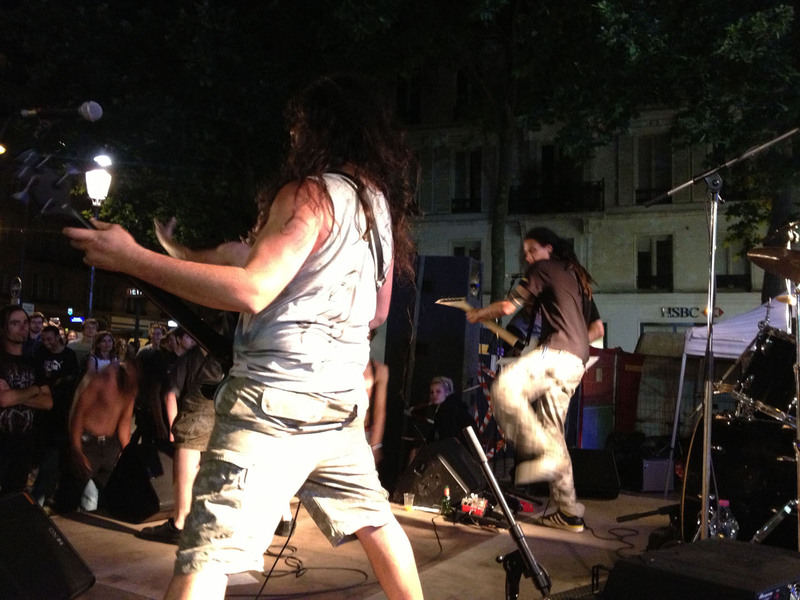 A thrash band raged in front of the Cirque d’Hiver, while just next store in the shadows at Bar du Cirque, a sweet little quartet was doing Beatles covers. 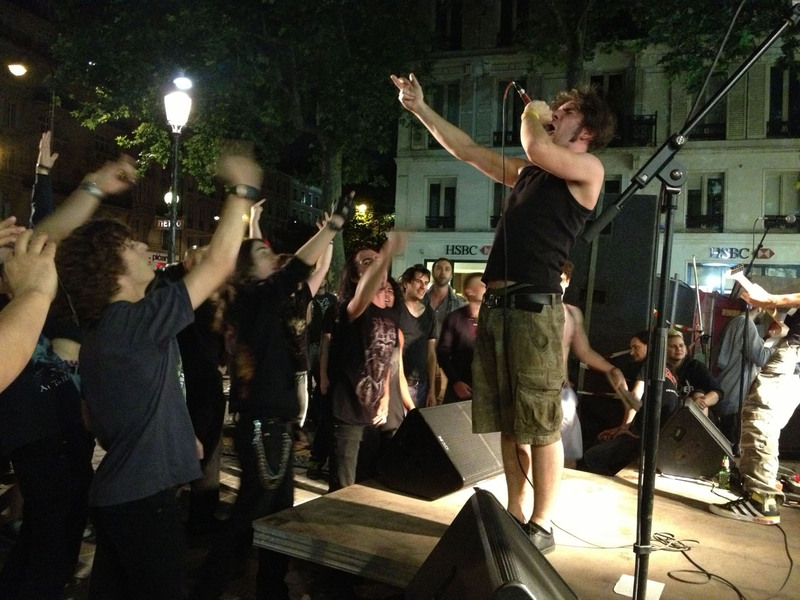 Whatever your thing—techno, punk, Brazilian, chorale—there was something for you in every one of Paris’s 20 arrondissements. 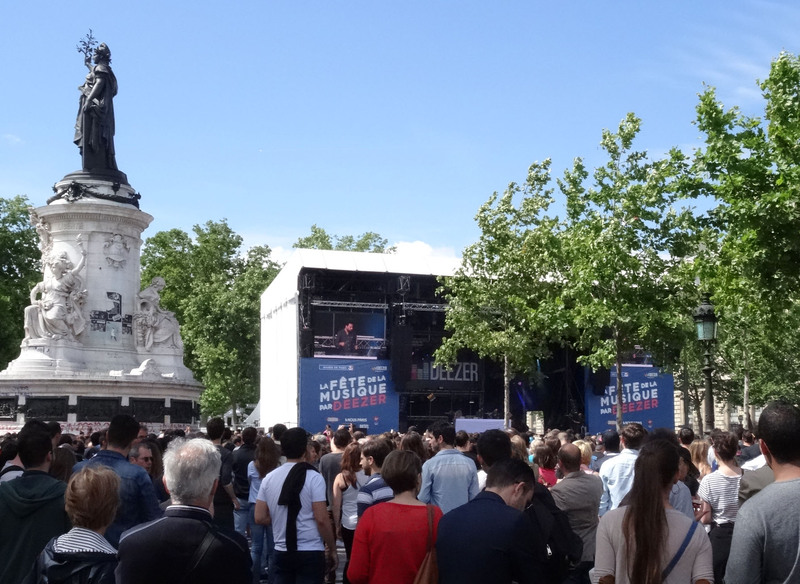 I focused on the 11th and the adjacent 3rd and 4th arrondissements, which included Place de la Republique where a huge stage setup housed headliners. By early afternoon, people had already begun to stake their turf in preparation. 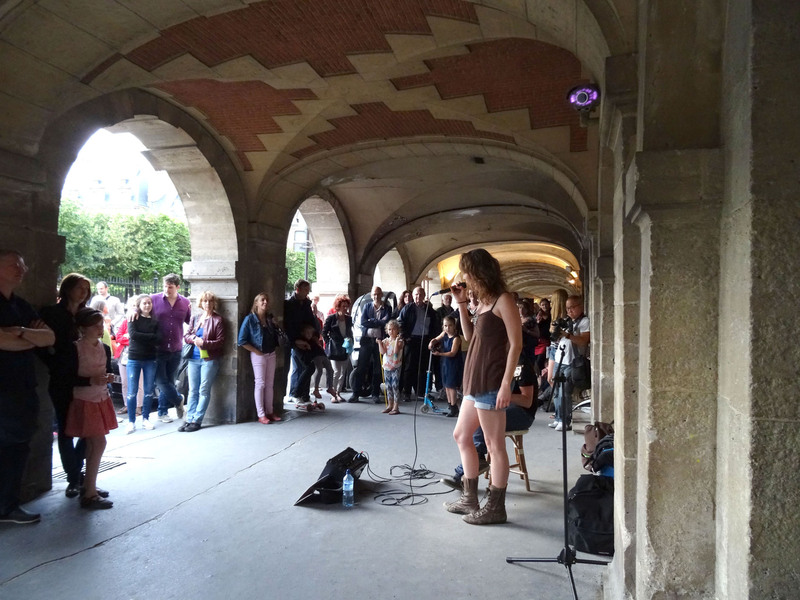 Me, I preferred the smaller acts that performed on the sidewalks outside bars, or on street corners here and there—often amateur bands put together by guys with day jobs; young kids getting their chops up in front of a willing audience of music lovers. 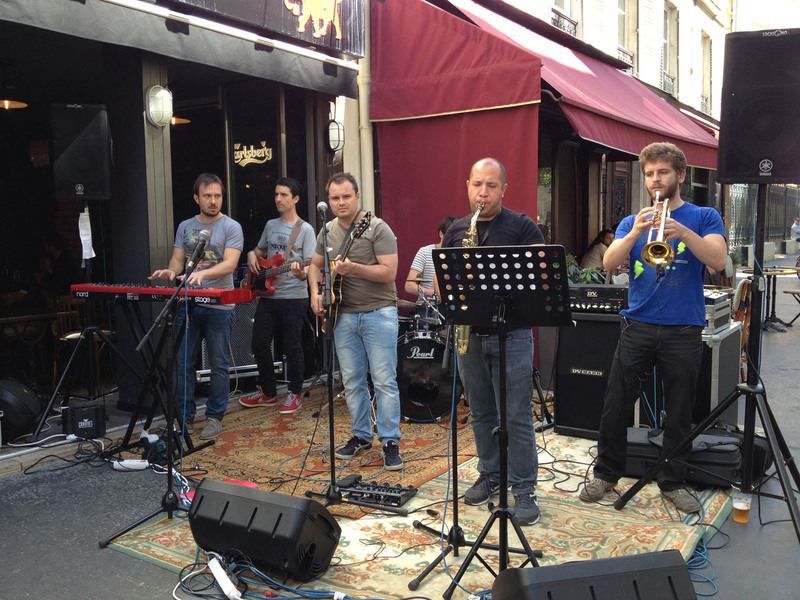 On Rue Amelot, a band covered Jimi Hendrix’s “The Wind Cries Mary,” adding their own punchy horn sound to the mix. 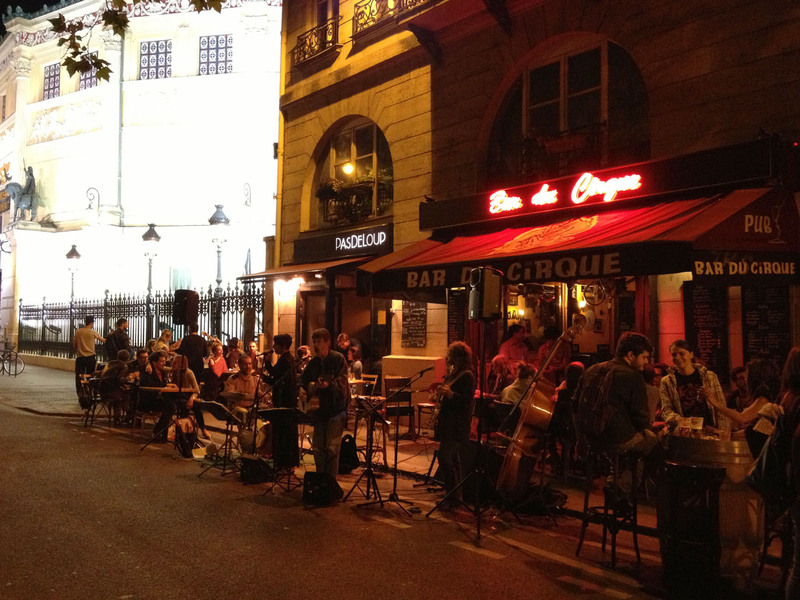 Outside a bar on Boulevard Voltaire, a pretty man with long blond hair sang “Sweet Home Alabama” and a Doobie Brothers song in French. 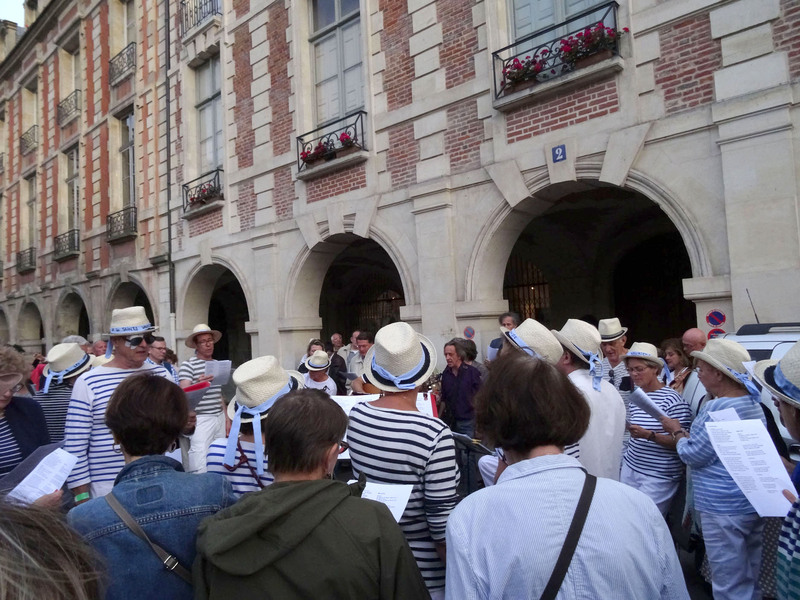 A young opera student gave her best “Voi Che Sapete” on Place des Vosges, while across the park, a marinière-clad group led a singalong, drawing a large crowd who, lyric sheets in hand, sang their hearts out. 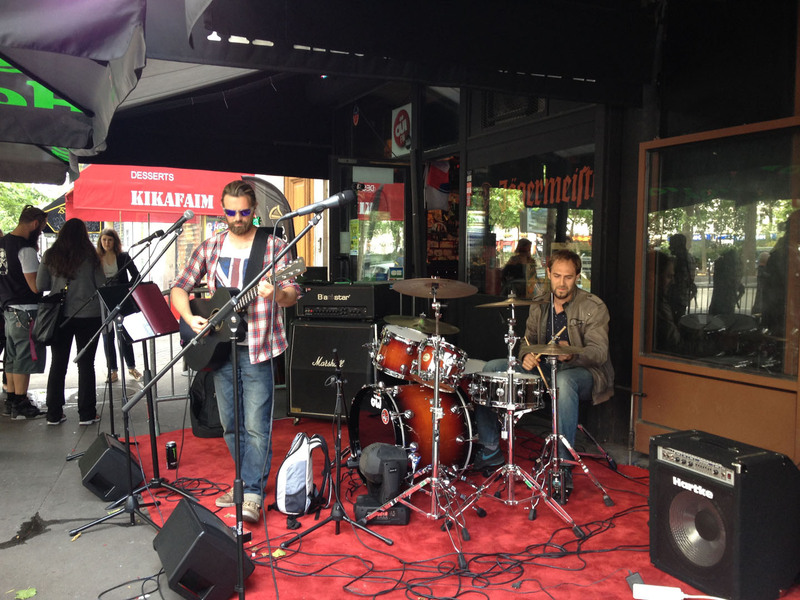 There was still more to see, and a text message from a friend sent us to Cafe La Perle. Come! Fun! his text bade me. 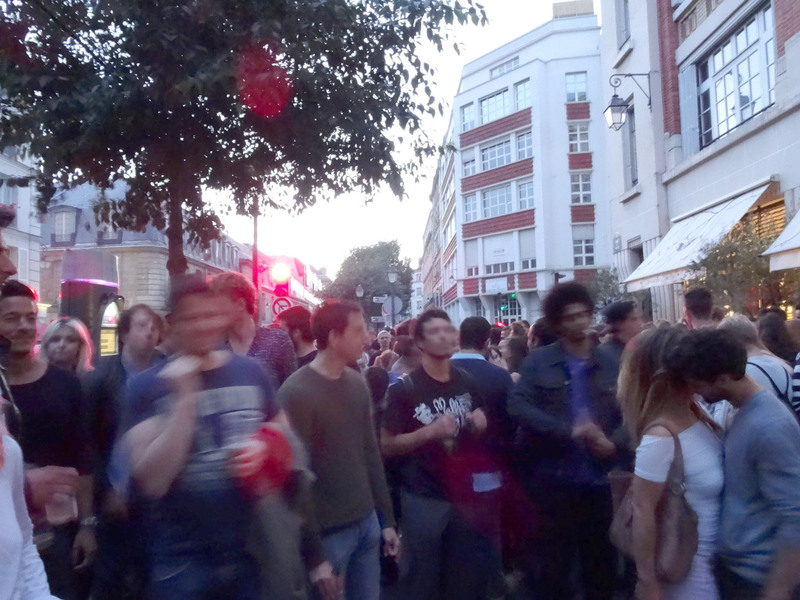 A techno block party had taken over the street in front of the bar, a DJ whipping the crowd into a frenzy of jigging arms and legs as the smoke from the barbecue where merguez was grilling subbed in for a dry ice machine. The sun, which still hung above the horizon at 9:30 p.m. lit the sky like neon—red, orange, yellow. 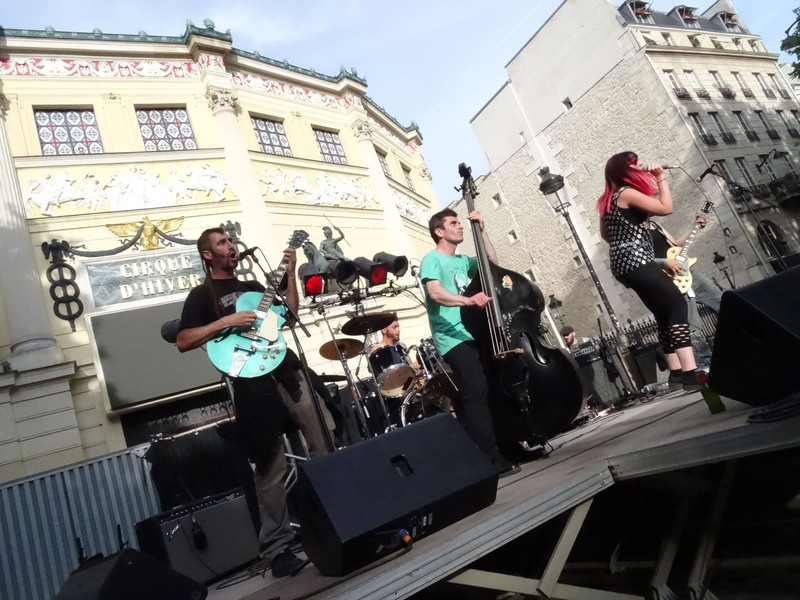 6:30 p.m.: A punk band kicks things up in front of the Cirque d’Hiver. 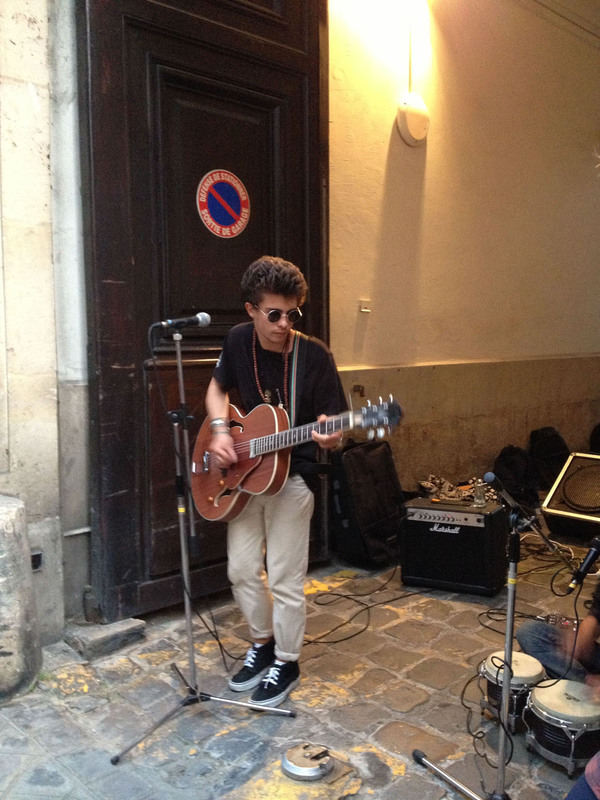 Just a few of the many acts I saw in three arrondissements.